Unite at the Arizona Tea Party! It is time to act. Please comment if you will be attending. If it is possible, we will be establishing a meeting point. The time has come to stand up and be heard. We are simply asking that every taxpaying American citizen join the movement to make our voices be heard. 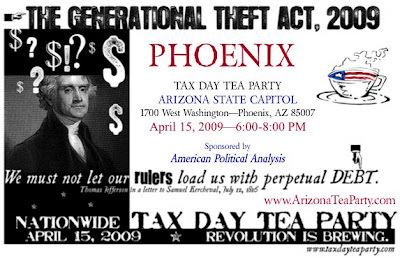 Help us make this the nation's best and largest tea party protest on Wednesday, April 15th. * No violence, no threats, no profanity, no racism, no law-breaking. * Take the high road. Be civil. Cynthia and I will be there.